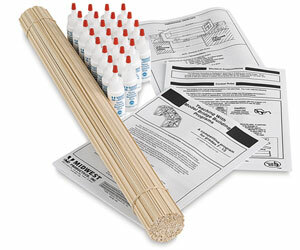 These class packs contain materials for 24 students to build and test a wooden bridge. Bridge building is a popular classroom activity, challenging students to design and construct a bridge, calculate its efficiency, and select the best design. Contains 360 pieces of 3/32" × 3/32" × 24" basswood, which is stronger and more consistently dense than balsa wood. Also includes 24 bottles of white tacky glue, 24 sets of instructions, competition design parameters to conduct a competitive lab activity, and the teacher’s guide, Teaching with Model Bridge Building Programs .